With flood insurance legislation at a standstill, insurers are lining up behind a new banking regulation that could help them compete with the federal government’s $1.3 trillion flood insurance program. The rule could make it easier for mortgage lenders to accept private flood insurance policies offered to homeowners in Florida, Texas, and other areas ravaged by hurricanes. Flooding from hurricanes and rising sea levels linked to climate change has heightened the threat to U.S. real estate and infrastructure, according to the 2018 national climate assessment. Regulators said more than 300,000 policies in high-risk zones could be covered by private insurers under the rule. One insurer said the rule could triple the current number of private policies. 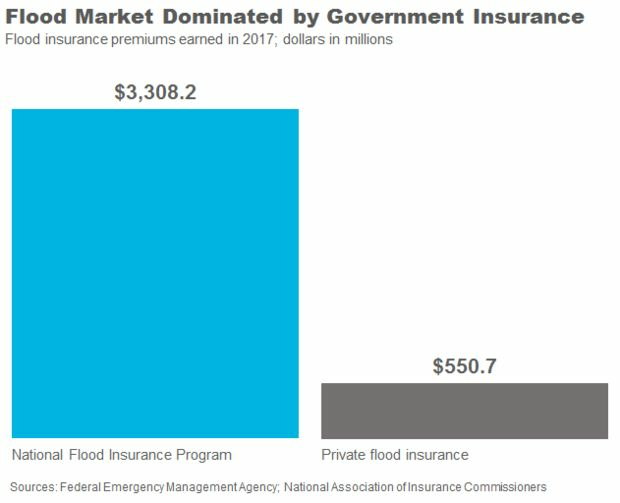 The government-backed program accounted for about 83 percent of flood insurance premiums received in 2017, according to data compiled by the National Association of Insurance Commissioners. SmarterSafer — a coalition of insurance, environmental, housing, and consumer organizations — was one of several groups that welcomed the rule released last week. 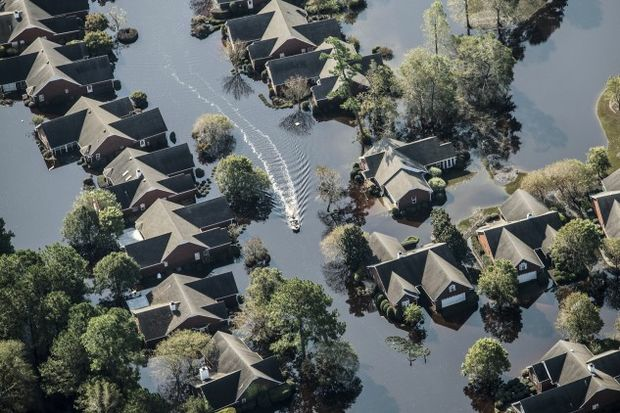 “The best way to make sure people have flood insurance is to make sure they have more options,” Jenn Fogel, a spokesperson for SmarterSafer, told Bloomberg Government. The final rule was approved by two regulators — the Federal Deposit Insurance Corporation and Office of the Comptroller of the Currency. It’s still under review by three others — the Federal Reserve, Farm Credit Administration, and National Credit Union Administration. It would go into effect July 1 once approved by those agencies. The Federal Emergency Management Agency, which manages the National Flood Insurance Program (NFIP), has set a “moonshot” goal to double insurance coverage by 2023. “We need both the NFIP and an expanded private market if we want to markedly increase flood insurance coverage for the nation,” then-NFIP head Roy Wright said in 2017. FEMA’s goal may be out of reach, however, if private insurers can’t compete. By expanding the marketplace for private insurers, the rule could help fill a coverage gap that has left some flooded homeowners on the hook. Under the NFIP, property owners in high-risk flood zones must be insured to get a mortgage loan from a federally regulated lender. Despite the mandatory purchase requirement, most losses from recent major hurricanes, including Harvey and Florence, were incurred by uninsured properties, according to CoreLogic Inc., a property data analytics company. Many damaged properties were located outside of a high-risk zone. A 2012 law required agencies to issue a rule directing banks and other lenders to accept private flood insurance for property owners in high-risk areas. A qualified private policy must provide coverage that’s “at least as broad” as a standard NFIP policy, among other requirements. Under the final rule, lenders wouldn’t have to conduct their own review of a private policy if it contains a statement from the insurer certifying that it meets the definition under the 2012 law. Many lenders say they don’t have the expertise to evaluate insurance policies during a home sale. The rule would also give banks more discretion to accept private insurance policies that don’t meet the definition. That would allow them to “continue to accept the multiple-peril policies that already insure many commercial properties,” Joe Pigg, senior vice president of mortgage finance at the American Bankers Association, said in an emailed statement. Other supporters of the final rule include the National Association of Realtors and the National Association of Mutual Insurance Companies. 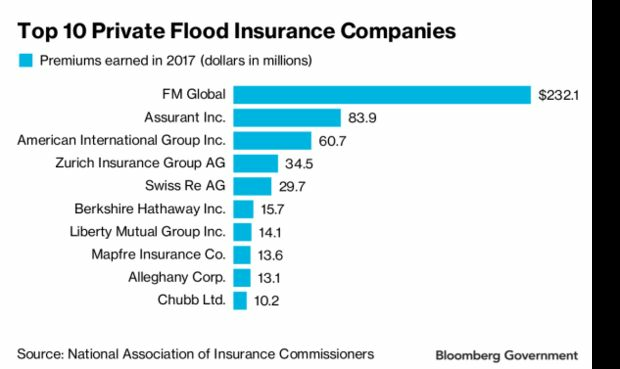 The regulation could also bolster companies that currently offer private flood insurance, including FM Global and Assurant Inc. Some groups said legislation is still needed to support private flood policies, even after the rule goes into effect. A 2017 proposal would have allowed a property owner to qualify for a discounted NFIP premium rate if they switched back to a government policy after a period of continuous coverage with a private insurer (see BGOV Bill Summary). “Without continuous coverage, consumers with grandfathered NFIP policies are effectively penalized with higher rates for attempting to purchase an NFIP policy after leaving it for the private market,” Lauren Pachman, national counsel and director of regulatory affairs at the National Association of Professional Insurance Agents, said in an emailed statement. The measure also included industry-supported language that would have made it easier for private insurers to sell their own policies based on NFIP data. Lawmakers will have another chance to expand private flood insurance before the 2019 hurricane season begins. The government-backed program is slated to expire May 31 if Congress doesn’t act.